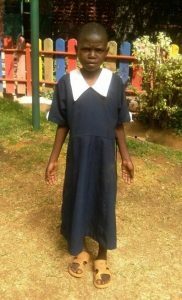 Kamande is currently under the care of an organization called “The Nest” in Limuru, Kenya. It is an organization we have been helping to support for a number of years. Kamande was taken there by authorities after his father was imprisoned for beating him so badly across his bottom that he had to be hospitalized. When taken from the hospital and sent to The Nest, he stood three hours in the car because it was too painful to sit due to the abrasions and welts left on his little body. The beating he received was inflicted upon him as a punishment for eating someone else’s food because he was hungry. At present, The Forgotten International will be exploring the possibility of adding this little boy to the children we sponsor through our Children’s Fund, and in doing so, take steps to ensure that he is educated and eventually has a chance at a decent life. Hopefully, too, his wounds will heal and soon he’ll be able to wear pants and play with other children at his school and group home. If you would like to learn more about this child and in some way help us, help him, please contact us. Thank you.